I recently posted some photos of this moth caught in my garden trap seeking ID confirmation. 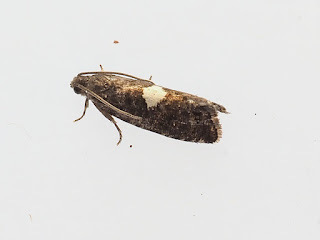 Oliver Wadsworth kindly collected the specimen and has carried out a gen det and it is confimed as a male Pammene spiniana. This is only the 3rd Worcestershire record and the first since 1987 so I am very chuffed to have spotted it and my thanks go out to Oliver. Needless to say I am being extra vigilant with my micros now!